The Department of Metallurgy was established in 1936.The Department of Metallurgy is a process and end product regulatory department within the Ministry of Mines and Mining Development. It provides technical services to the Mining, ceramic and foundry Industries. 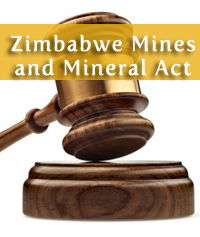 It conducts research into products and processes to generate value added products from Zimbabwe’s Mineral resources. The department comprises of six sections namely Mineral dressing, Chemical Laboratory, Fire Assay, Mineralogy, Physical metallurgy, and Ceramic Sections apart from the Administration Section. a) Enforce all statutes relevant to processing and exportation of mineral resources and mineral products. b) Monitor, control and audit mineral processing plants. c) Verify all minerals and mineral products for exportation. d) Provide professional and technical advisory services to the mining industry with a special emphasis on small scale operators. e) Help in commissioning of new plants for small scale operators. f) Participate in the monitoring and surveillance of mineral processing plants. Statutory Instruments 329,178,63 and other related regulations. Commissioning and Monitoring mineral processing plants in the mining industry. Performing Metallurgical audits on declared production for processing plants in the Mining industry. Carrying out test work analyses on samples from clients for mineral identification, beneficiation and value addition. Providing of quality control test work on finished or broken down mechanical parts. This section undertakes bench scale and pilot plant scale metallurgical test work for process flow sheet design and optimisation. Agitation and percolation leaching of metals. Floatation at laboratory and pilot scale. Specific gravity determination of ore samples. Provides qualitative chemical analysis of most elements including base and precious metals using both wet and dry methods. Atomic Absorption Spectrophotometer (AAS) for analysis of ore samples. Optical Emission Spectrometry (OES) mostly for foundry plant analysis of trace elements using a spark stand. Acid attack where mineral ore is digested using various reagents with the aid of heat. Provides qualitative and quantitative analysis of metals in ores using pyro metallurgical methods and gravimetric analysis. The techniques are applied for precious metals such as gold and silver. The section is equipped with fusion furnaces, electrocupulation furnaces and balances.